Available with 2" or heavy-duty 2-3/8" O.D. leg frames, these portable octagon tables were designed to bring a futuristic, modern feel to any environment. 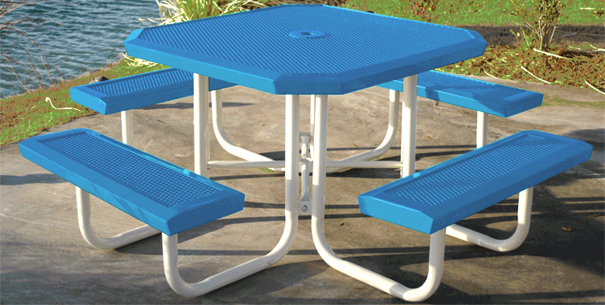 The 11 ga. Perforated Steel table top and seats can be finished in a variety of lightly textured matte Polyethylene color coatings that will maintain a vibrant appearance against weathering and corrosion for years to come. These 46"Sq. (3 Seat ADA - 46" x 57", 2 Seat ADA - 46" x 68") octagon tables are available in four, three or two attached seat models. The angled bench seats and table edges are supported with 1-1/2" x 1/4" flats that provide extra bracing under the frames. Tables come with a standard umbrella hole located in the center of the top. Umbrellas and other optional accessories are available to order below.